Just a few more days between us and a whole ton of air travel. I know I’m getting excited, and if Facebook is to be believed, I’m not the only one. 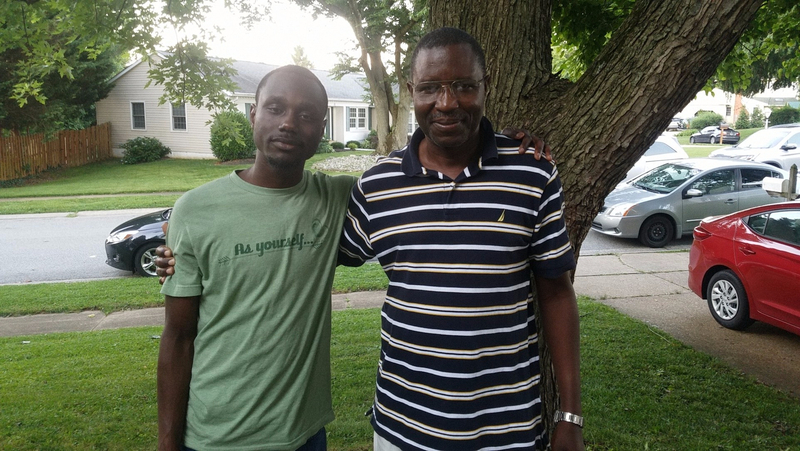 David Niyonzima (the director of THARS, wearing glasses in this picture) is in town, and will be traveling with us to Burundi. It’s all coming together at once; I can’t believe we leave in two days. It was my pleasure to sit down with Bain (also pictured) at the beginning of last week and have a conversation about his thoughts on going to Africa for his first time, and the opportunity for him to explore his ethnic heritage. It will be his first time leaving the country at all, though having been out west, he knows the infinite joys of airplane travel. Bain is an educator by trade, and on this trip, he’ll be working with Chris and the children. They met working at Urban Promise in Wilmington, Delaware, which has a program called Street Leaders. The idea behind it is training older kids to look out for younger kids, promoting community and openness to education on the part of younger people. Bain is bringing his expertise in this strategy to Gitega, where the team intends to set up a similar system between older and younger kids. More on that later. Our conversation began where any should: at the beginning. Africa to young Bain’s mind was the picture drawn by the American school system: a place, across the Atlantic, full of valuable resources and conflict. Deserts and jungles full of animals were there, and most importantly, it’s where his people came from. The first drastic change to his image of Africa was in college, when he began to come into contact with Africans. In talking to them and learning the ways that African countries have modernized, and the way that wealth is distributed, that image he’d grown up with began to shift. It was “the vibe” that ensnared him; an upbeat outlook that pervades African society and simply does not exist on this side of The Pond. I’ve seen it myself in smiles overflowing with joy as adults my parents’ age run around a field, kicking soccer balls back into a knot of eleven-year-olds. Between seeing that quintessentially African joy and getting a good look at a map that actually represented the size of land distributions across the world, Africa became a big deal to Bain. When I asked him what it was he was looking to learn on this trip, his eyes turned thoughtful. After a moment, he said that he would be watching for why he felt called. At a Bible study before anything for this trip was finalized, a woman in the group made a point to tell Bain that she felt God wanted him in Africa. When a statement like this comes from someone you know, it’s a difficult thing to shake, and his clarity about going has only grown since then. New places are full of things we can’t imagine or prepare ourselves for. It’s one of the magical things about travel, but also why it’s such a risk. I asked Bain what—if anything—he was worried about. He told me he didn’t know how he would handle seeing things like rampant wealth disparity up close. I didn’t really have words to reassure him. It’s a difficult thing, and everyone handles it differently. I’d like to think it’ll be easier than he anticipates, but who can say for sure? My best offer is the ear I can lend, should the need arise. For now, I need to pack my personal bags and get the last good sleep before more travel than can possibly be good for a body. I’ll be posting updates throughout the process, and blog posts will certainly go up at least once a week while we’re in Burundi. Stay tuned!